• Be realistic when you fix the player skill levels, for example forwards will usually be faster runners than backs, but of course they won't be so good at defending. The three numbers shown under the table of skill levels give the number of skill points for each skill, and if you and your friends are picking squads you could decide to have a certain number of skill points to allocate to the players. • Learn to master the simple skills before you attempt some of the more sophisticated moves. • Remember that because of the angle from which you are looking down on the pitch it doesn't seem as wide as it really is. 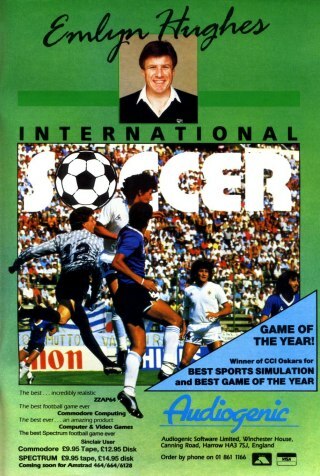 Emlyn Hughes INTERNATIONAL Soccer offers realistic arcde action and football management combined into one great game! The wide range of facilities and control options have between designed in such a way that you can sit down and play without hours spent studying the manual, and getting to grips with the controls. One or two can play, wither against each other, or against the computer. You can even watch two computer teams playing each other! Player skill levels and fitness levels vary, so picking the right team is just as important as the way you control your players during the game. Fixture lists, results, and league tables may be displayed at any time duting the season, and if you have a Commodore or compatible printer you can even print them out as a permanent record.